Is there anyone that is not enjoying the best of this season/summer and the lovely atmospheric condition that the sky is rendering? I for one, is on top of the list because apart from the beautiful and lovable weather condition, it is also the time of the year when you can grill virtually everything. Infact if you haven't given this a shot before, then let this post and recipe act as a wake-up call or rather call-to-action for you. I bet you that you would want to do this over and over and over and over agaiiiinnnnn... Splendid! I love watermelon due to the loads of multivitamins and minerals packed in the fruit. It might interest you to know that this fruit, also known as Citrullus lanatus belongs to the plant family of Cucurbitaceae, which originated from West Africa. 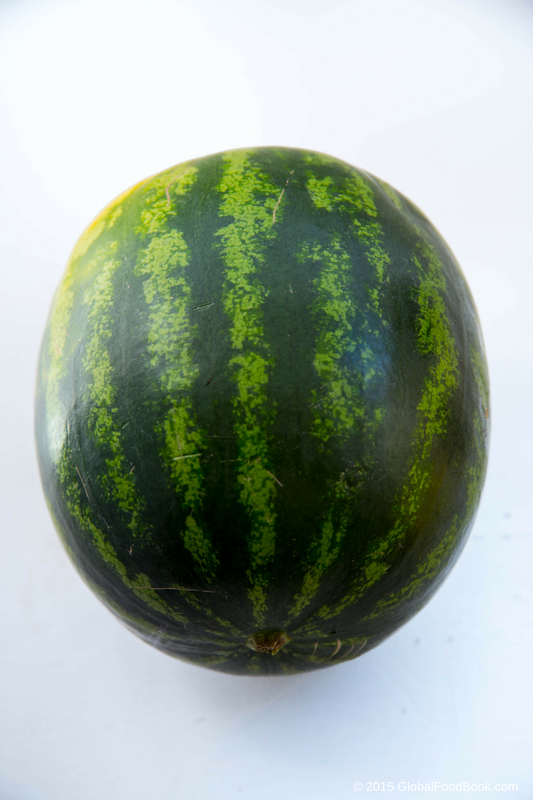 Watermelon is mainly planted for it's refreshing and nutritive red flesh and rinds. 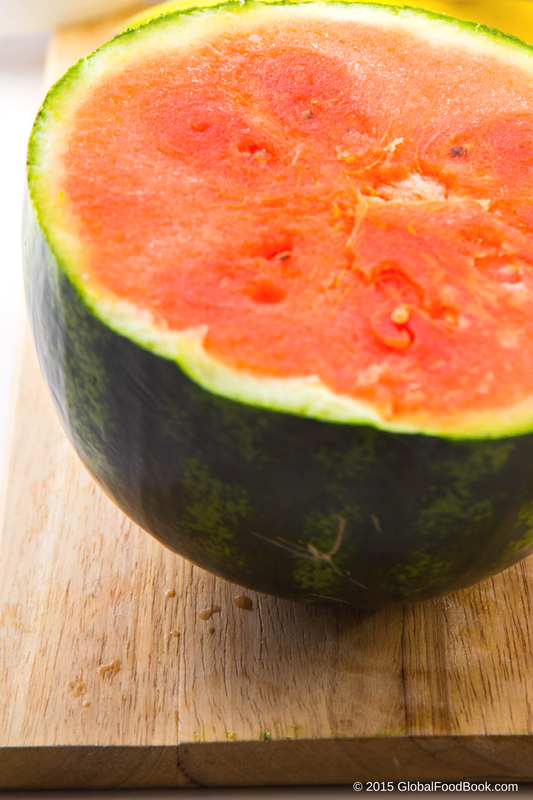 Watermelon is an excellent source of Vitamin C, Vitamin A, Magnesium, Iron, Potassium, dietary fiber and protein. 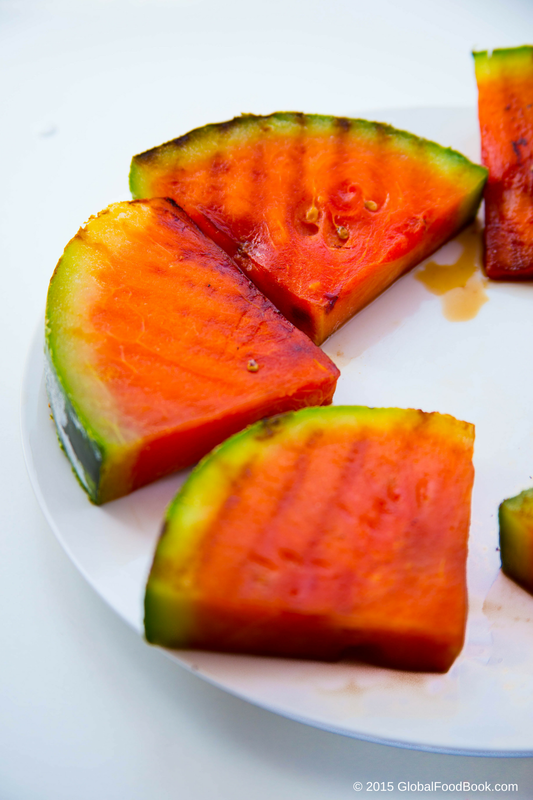 While I enjoy grilling almost anything edible, there is always a spectacular spot in my heart for a simple grilled watermelon with watermelon drink to complement it. 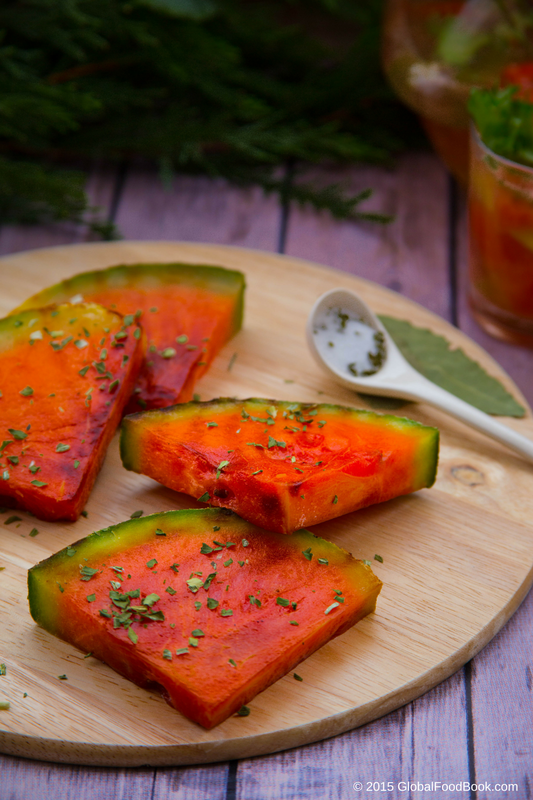 There is almost nothing refreshing than some slices of fresh watermelon straight out from the griddle, still warm, drizzled with some salt and spiced herbs. The blend of spices combine with the heavenly flavor/smell oozing out from the griddle to render some delightful piece of grilled watermelon. Although I had grilled several fruits in the past, I know for sure that this one is among the top of the list. They are just the best mates and you for sure can agree that both of them are virtually ready for anything. 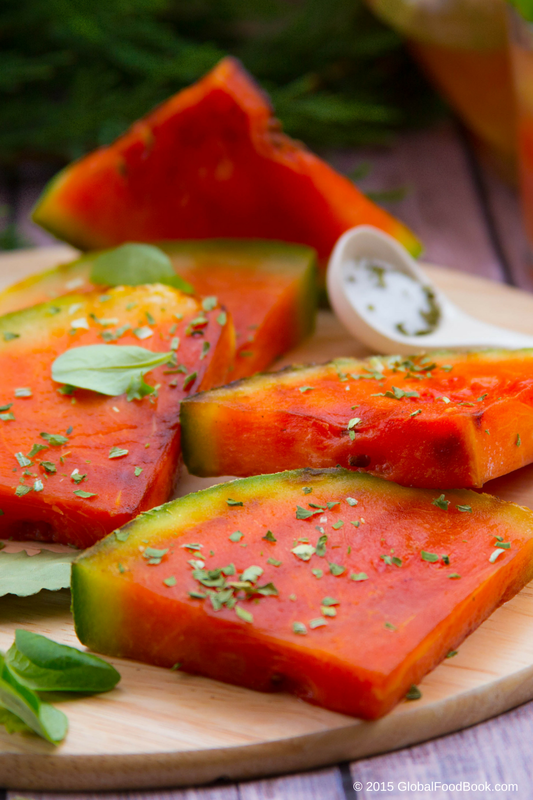 While grilling the watermelon requires you to slice and place the watermelon on a griddle, sprinkle with salt and herbs; making the drink on the other hand only requires you to scoop out the watermelon red flesh from the rind/skin, de-seed it, slightly squash the watermelon flesh, pour clean water into it and then mix. This is served with some fresh mint leaves. 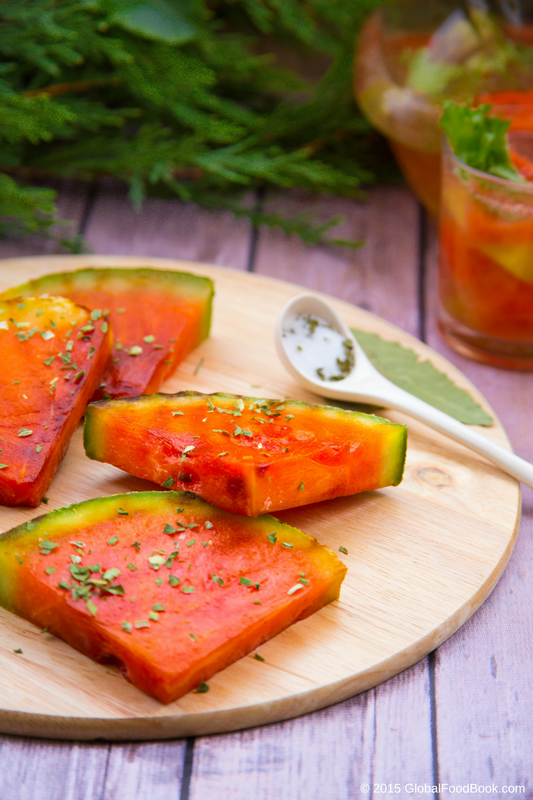 This grilled watermelon with watermelon drink can conveniently serve as a simple breakfast, lunch or dinner dessert you can ever think of. It is absolutely up to you to give it a try and I have no doubt that you will enjoy every bit of it much as I did. Wash and cut the watermelon into desired sizes and shapes. Sprinkle with dried chive leaves and salt to taste. Place on a griddle and allow to grill for few minutes turning over each side to grill well. Bring out from the griddle and serve immediately warm. FOR THE WATERMELON Scoop out the watermelon red flesh from the rind/skin and de-seed it. Slightly squash the watermelon flesh, pour clean water into it and then mix. Serve the watermelon drink with some fresh mint leaves.